If you live within a few houses of me, you will know that sometimes I just get in the mood to bake. And living with just my husband and I, we can NEVER eat all that I bake. I will bake bread (thanks to my mother for my 4 mini bread pan that is perfect for giving loaves away! ), cookies, brownies….pretty much whatever i feel like giving a try. And if you live within a stone’s throw, you get your share as well. But, this Easter I was headed to my friends Tim and Julie’s house, along with others – so it was the perfect time to bake something yummy for the crowd. Although I had my two nephews with me other the weekend, I thought I would use it to my advantage instead of against me, and enlist a little helper. There would be lots of kids at the party, so I thought making something kid-friendly would be ideal. I found this recipe in Food Network Magazine (on an article talking about cupcakes that taste like candy bars) and was immediately drawn to the fact it was supposed to taste like a Reeses. 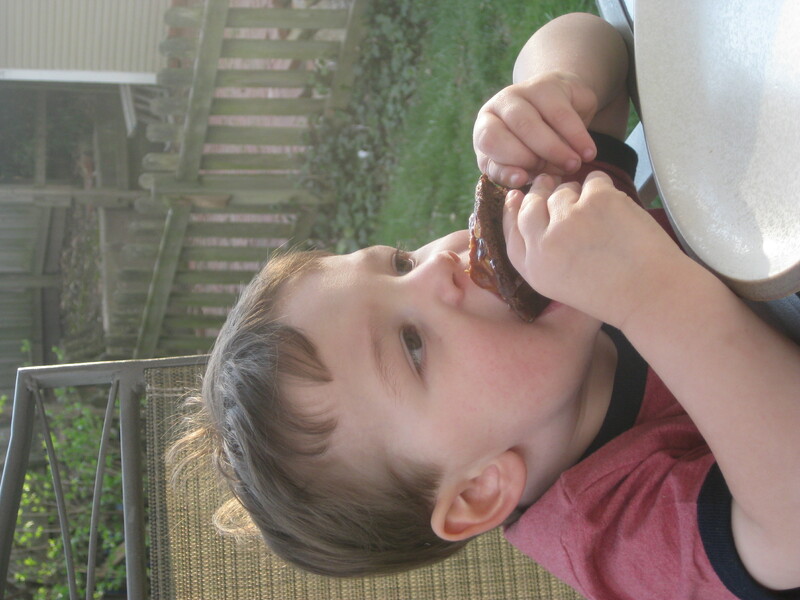 Not only is that perhaps my favorite candy, but I knew my nephew, Nicholas, was a fan of chocolate and peanut butter as well. A few tips on these – yes, you can make them with kids! Nicholas, being 6 years old, lasted through the making of the peanut butter topping before finding cartoons more entertaining. These cupcakes aren’t your average cake recipe plus icing – it is more involved. 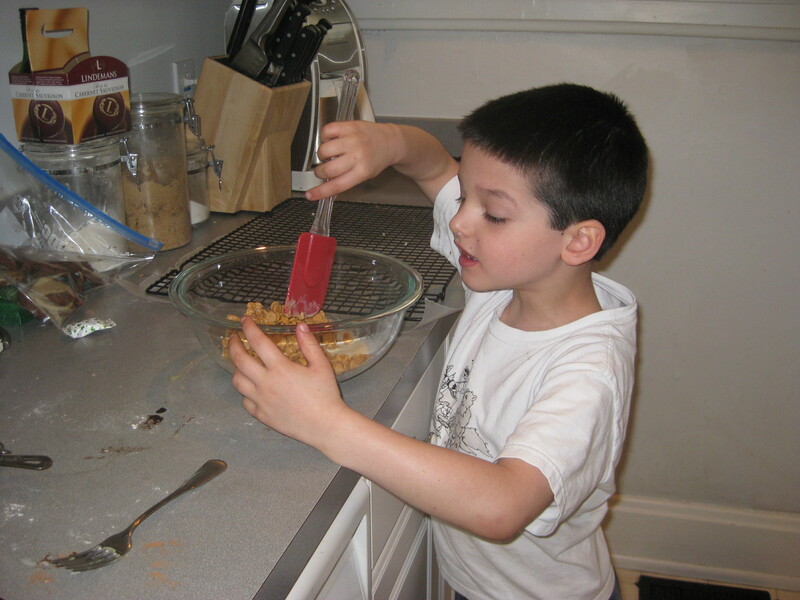 But lots of steps can be made with kids’ help – stirring of the mixture, putting the mixture in the pans, etc. Also, don’t overbake these. I find them to be cooked before the 20 minutes suggested – if you overbake they will become a bit dry. I might even trade the cake recipe for another next time. But, the brilliance of these is in the peanut butter topping and glaze. You might want to double the peanut butter recipe (mine ran a bit shy on the last few). Another great thing about this recipe is the mini muffin pan you use – you get more cupcakes and they are the perfect size for kids (or myself who is trying to lay off the sweets!). Make the cupcakes: Position a rack in the middle of the oven and preheat to 350 degrees F using the convection setting, if available. Line a 24-cup mini muffin pan with paper liners. Combine the butter, cocoa powder and 1/4 cup water in a microwave-safe bowl, cover with plastic wrap and microwave until the butter melts, about 2 minutes. Whisk to combine, then whisk in the brown sugar. Whisk the flour, baking powder, baking soda and salt in a large bowl. Whisk in the warm cocoa mixture. In another bowl, whisk the buttermilk, egg and vanilla; stir into the batter until just combined but don’t overmix. Divide the batter among the prepared cups, filling each three-quarters of the way. Bake until the cupcakes spring back when touched, about 20 minutes. Let cool in the pan 5 minutes, then transfer to a rack to cool completely. Make the topping: Bring the cream to a simmer in a small saucepan, then pour over the peanut butter chips in a bowl and let stand until the chips melt, about 5 minutes. Whisk until smooth. Refrigerate until the topping is set, about 10 minutes, then beat with a mixer until fluffy. 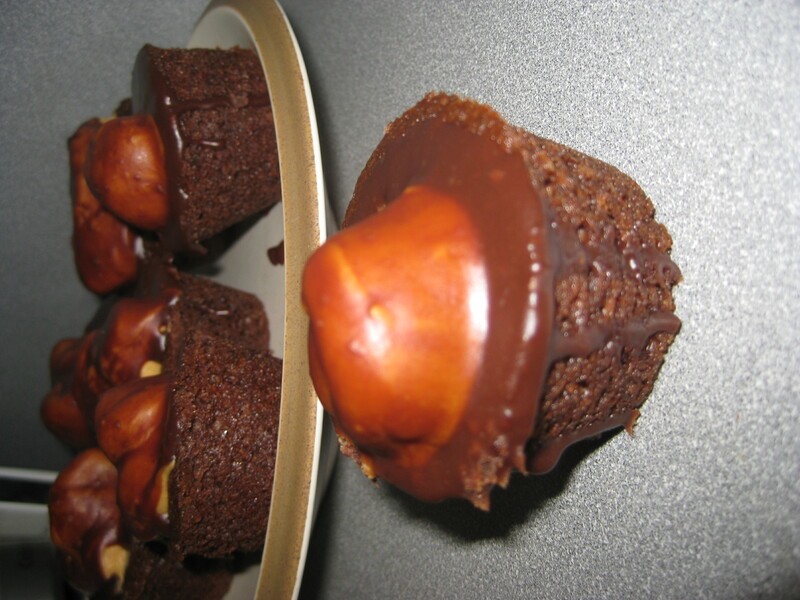 Transfer to a pastry bag with a 1-inch round tip and pipe peaks onto each cupcake. Place in the freezer while you make the glaze. Make the glaze: Put the butter, chocolate and 3 tablespoons hot water in a small, deep microwave-safe bowl, cover with plastic wrap and microwave on 50 percent power until the chocolate melts, about 2 minutes. Whisk until smooth. Dip the frozen peaks of each cupcake into the glaze, letting the excess drip off. Refrigerate until set, about 5 minutes. So, I normally don’t blog drinks, but when we made this one the other night, I knew I had to. I saw something similar in the Food Network Magazine, but it was missing Baileys! So, I made my own version of it (adding Baileys and swapping out the espresso for decaf coffee) and it was fantastic. It is like a warm, chocolately dessert drink for a cold winter night. Enjoy! Microwave chopped bittersweet chocolate with 1/4 cup water in microwave for 2 minutes on 50 percent power, stirring once. Divide among mugs (clear if you have them). 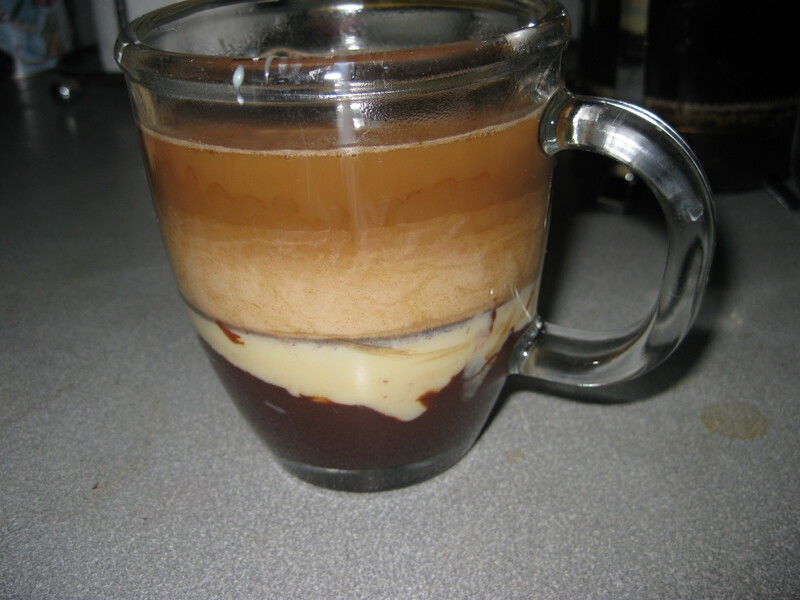 Then top each with a spoonful or two of condensed milk, some coffee and a shot of Baileys. Stir before drinking but make sure to admire the beautiful layers first! With an Italian husband and a great love for Italian food, quite a bit of it gets made in our household. And as I continue to look at recipes from his family, Bon Appetit and various sources, there is a lot of talk about the San Marzano tomato. I have always wondered if it was merely another brand, or something organically grown? Will it really change my sauce into something more delicious? I had always doubted a tomato type could do such great things until I finally went into my International food aisle and bought some. Yes, this tomato does indeed have powers beyond your imagination. I am a believer, and may never go back. The story goes that the first seed of the San Marzano tomato came to Campania in 1770, as a gift from the Kingdom of Peru to the Kingdom of Naples, and that it was planted in the area that corresponds to the present commune of San Marzano. For those who know Italy’s geography know that this area contains volcanic soil in the shadow of Mount Vesuvius. It is believed that this soil acts as a filter for water impurities. The result – a strong, sweeter, less acidic tomato that will give your sauces a “wow” factor. This recipe came from Food Network Magazine with some improv – feel free to tinker with the recipe as I did. Also, the simple to make focaccia recipe (also Food Network Magazine) is a great complement. Note: don’t make the mistake of not letting it simmer all day (hence the “Sunday” in its name). It helps the flavors blend and results in a richer sauce. Another Note: Yes, the Italians call it gravy and yes, I didn’t know this until I married one. Don’t confuse this with the turkey gravy you get at Thanksgiving – this is your hearty meat sauce for spaghetti! Soak the bread in the milk until the liquid is absorbed, about 8 minutes. Meanwhile, combine the ground beef and pork in a bowl with the egg, cheese, minced garlic, parsley, 1 teaspoon salt, and pepper to taste. Add the soaked bread and mix with your hands until combined. Form into 16 meatballs. Heat the olive oil in a heavy-bottomed pot over medium heat. Add the meatballs and cook, turning, until browned on all sides, about 10 minutes. Transfer to a paper-towel-lined plate. Add sausage to the pot and cook until browned, turning, about 10 minutes. Transfer the meat to a large bowl. 4 minutes. Crush the tomatoes into the pot with your hands and pour in the juices. Stir in the tomato paste, season with salt and pepper and cook 5 minutes. Add 5 cups water and the bay leaves, then return the meatballs, beef shin and sausage to the pot, stirring carefully. Bring to a low boil, stir, then reduce the heat to low. Cover and simmer 2 hours, or until the shin meat is very tender. Uncover and simmer until the sauce thickens and the shin meat is falling off the bone, about 1 hour 30 minutes. Transfer all the meats with a slotted spoon to a bowl and cover with foil. Simmer the sauce to thicken, about 20 minutes. Discard the bay leaves. Meanwhile, bring a large pot of salted water to a boil; add the pasta and cook as the label directs. Drain and toss with enough sauce to coat lightly, then top with more sauce and the meat. Garnish with parmesan, if desired. One of the things that is so much fun about cooking is taking a concept and making it your own. I saw this recipe in the Food Network Magazine and it looked fantastic – but I had a few ideas. What could be better than ham? Pancetta, of course. And what could be better than fig jam? The unique spruce tip jam we brought back from a recent trip to Alaska. So, when I made this recipe it had a few substitutions…so you could certainly make some of your own. One thing I wouldn’t substitute, though, is the salad – the dressing has a great sweet tang and is the perfect complement to the dish. Mix the jam, thyme, and salt and pepper to taste in a bowl. Lay out a long piece of plastic wrap on a cutting board. Place the chicken on the plastic and brush half of the jam mixture evenly on top of each breast. Mound a quarter of the cheese on each piece of chicken, then wrap 2 slices of ham around each breast to cover the cheese. Place another piece of plastic over the chicken and gently pound with a mallet or heavy skillet until about 1/4 inch thick. Heat 2 tablespoons olive oil in a medium nonstick skillet over medium-high heat. Add the chicken and cook until golden and crisp, 3 to 4 minutes. Turn and cook on the other side until cooked through but still moist, 3 to 4 more minutes. Meanwhile, whisk the shallot, mustard, vinegar and the remaining jam mixture in a medium bowl. Slowly whisk in the remaining 3 tablespoons olive oil to make a smooth dressing. Place each piece of chicken on a plate and drizzle with dressing. Toss the greens with the remaining dressing; serve with the chicken. Potatoes are one thing I had never thought of on the grill until I saw this recipe from the Food Network Magazine. I made it this weekend for my sister-in-law and nephews and it was an easy thing to throw on the grill with burgers, etc. You can cut up and peel the potatoes early (which is what I did) so then all you do is mix it together then throw it into a sheet a foil on the grill (took me 2 minutes to prepare). Plus, I am a sucker for sweet potatoes – and as a bonus I heard they are even better for your than regular potatoes! Combine all ingredients in a bowl and toss. Place on a sheet of foil and fold up into a pouch. Grill over low head until the potatoes are tender, 20-25 minutes.